There are some beauty looks that are refreshingly low-maintenance and effortless, such as “second day” hair and the “no makeup” look, but one thing that we’re confident you’ll never see is the “loose lip skin” aesthetic. Ew. Let’s face it that our lips are exposed to a variety of elements that manipulate their well-being, from weather to eating, drinking, kissing, etc., so their visual condition may need a bit of work from time to time. Using a lip exfoliant or scrub will remove dead skin cells and loose skin, priming your lips for a layer of moisture via a superb balm to saturate your smackers thoroughly. 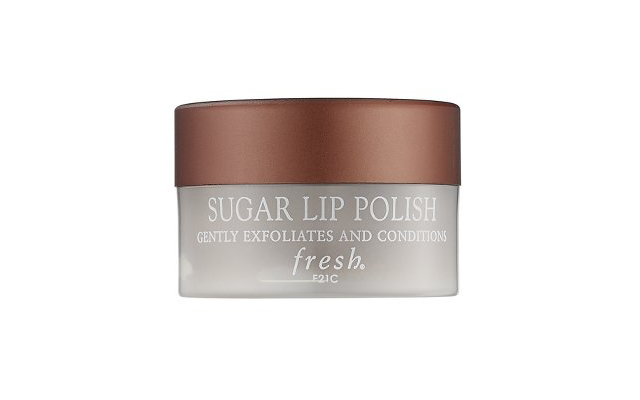 The Fresh Sugar Lip Polish has been a favorite over here for quite some time, as it exfoliates and nourishes the lips in one fell swoop. The formula is non-abrasive and natural, using actual brown sugar crystals to carefully buff and remove away flaky and/or rough skin. Hydration and nourishment is then imparted via the oils of meadowfoam seed, jojoba seed, grape seed, and shea butter. The ingredient of Vitamin E fights free radicals to prevent collagen and elastin breakdown. The lip polish is free of parabens, sulfates, synthetic dyes, petrochemicals, phthalates, GMOs, and triclosan. The incredibly sweet scent is a combination of molasses and brown sugar and is truly divine! Having smooth, healthy, balanced lips means that your lip gloss and lipstick application will adhere better and look seamless. This is especially essential when using bright or dark shades when you want your focal point to be on the lip color, and not your lip texture. A little goes a long way with this product, and it’s so easy to apply you don’t even need a mirror in front of you to rub it on and wipe off. Plus upkeep is at a minimum; two to three times a week will suffice.